Entity store refresh is automated and managed by the system. Administrators do not need to schedule or monitor the Entity store refresh with the system batch schedules. The refresh operation is based on anticipated latency. This functionality is enabled in Platform update 23. As an administrator you do need to opt-in to use this feature. 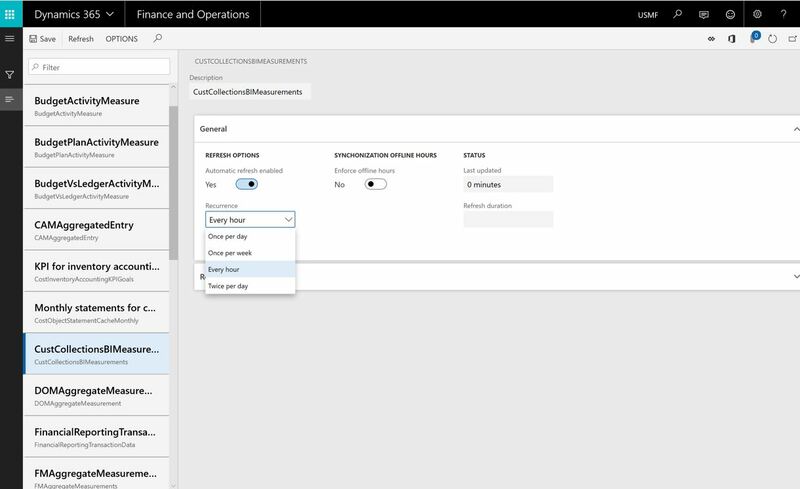 Complete the following steps to enable automated Entity store refresh. Go to System administration > Set up > Entity store. On the Entity store page, a message indicates that you can switch to the Automated Entity store refresh option. This option is managed by the system. An admin does not have to schedule or monitor the Entity store refresh. This action isn't reversible. After you switch to the Automated Entity store refresh option, you can't revert to the old user interface (UI) experience. You will now see the new experience. An admin can also refresh any aggregate measurement on demand by clicking the Refresh button. Additional options will be added in future platform updates. These options will include options for real-time refresh. When automated refresh is enabled, the system can disable the refresh of aggregate measurements. You must revisit aggregate measurements and validate that appropriate refresh intervals have been applied.